Glamping is all of the best parts of camping, with a hint of luxury and added comfort. 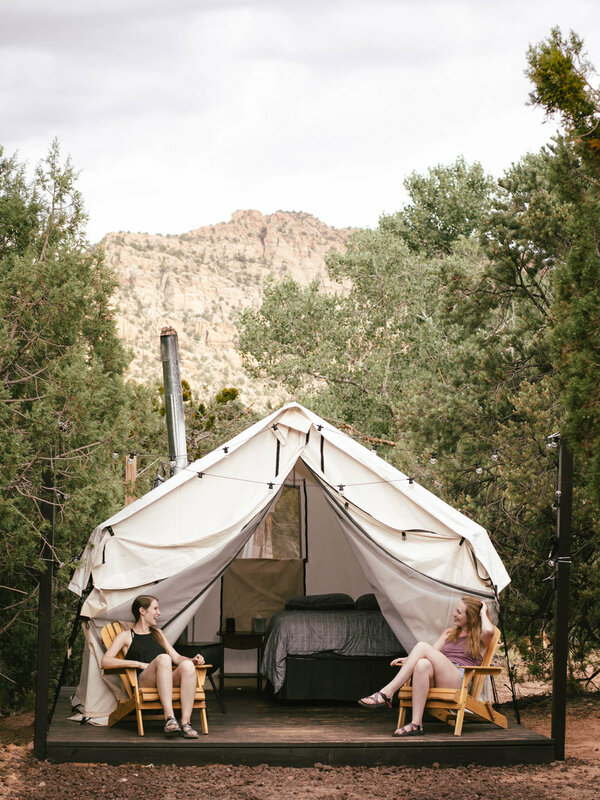 During our road trip through Utah, my friends and I discovered an epic glamping experience near Zion National Park. It's located in a small town called Hildale, and is run by a friendly local named Robert. Robert's glamping site is clean, peaceful, and private. The perfect place to relax after a long day at Zion, Bryce Canyon, or anywhere else in between. Hildale sits on the border of Utah and Arizona, with a population of about 3000 residents. It's a really small town, with a lot of history. Google Hildale, Utah and you'll likely see articles about polygamy and members of the FLDS church. In terms of nature, you'll be getting a healthy dose of Utah wilderness. The glamping site is surrounded by Zion-like rocks and canyons, and orange-colored soil. Hildale to Zion National Park - 1 hr. Hildale to the Grand Canyon - 1 hr. 45 min. Hildale to Bryce Canyon - 2 hrs. 15 min. The glamping tent is built up on a wooden platform, and made out of a high quality canvas material. Unlike a standard tent, there is plenty of room to stand up and move around inside, as well as an actual bed! In another corner of the tent, stands a little cooking station - complete with a cook stove and propane, paper towels, plenty of matches, and a cooler to store food in. While my friends and I visited during the summer, Robert’s glamping site also features a wood stove inside the tent. This ensures no matter what type of weather you plan on visiting during, you’ll be warm and dry at night. As for bathroom and shower facilities, there is a solar shower stall right outside the tent, and a nearby park with clean bathrooms and potable water. If you’ve never used a solar shower before, you may be a little surprised when you first see it, but know it is essentially the same as a regular shower. The main difference being you heat up the water ahead of time in the sun, and fill up the bag which serves as the water source for the shower head. The thing with normal tents is once they’re set up, no one really wants to go inside of them until it’s time for bed. Regular tents are small and compact, offering little room to get up or move around. When you’re glamping, it’s almost like staying in a tiny home. You can stand up, lay on the bed and read a book, or cook a meal on the cook stove - all from inside your tent. Glamping also requires little effort on your end. Since the site is set up and ready-to-go upon arrival, you can forget about pitching a tent or unrolling sleeping bags during your stay. If you’re wondering whether or not glamping still feels like camping, believe me, it does. You’re still out in the middle of nature, have access to your own personal firepit, and will likely fall asleep to the sound of crickets. The only difference is you’re doing all of that with a little added comfort. Although you may be exhausted from hiking around Zion already, check out one of the many hikes near Hildale if you have any energy left. Within walking distance of the glamping site is Maxwell Park. Here, a natural spring flows underground - never coming in contact with air until it’s pumped out of the park’s water spigots. This water is safe to drink, and what all of the locals prefer according to our glamping host, Robert. River Rock Roasting Company is by far the coolest cafe I’ve ever visited. From the front it doesn’t look like much, however, make your way to the outside patio and prepare to be amazed. Like a scene straight out of a movie, this cafe sits perched on a cliff side and overlooks the winding river below. As if things couldn’t get any better, the food is absolutely to die for. Order one of River Rock’s giant cinnamon rolls or fresh smoothies and you won’t regret it. We passed the Coral Pink Sand Dunes on our way over from Bryce Canyon, and really wished we’d had time to stop. You can go ATV riding through the dunes here, or try your skills at sand boarding. If you’re interested in reserving Robert’s glamping site, you can book your stay through this listing on Hipcamp, or through this listing on Airbnb. 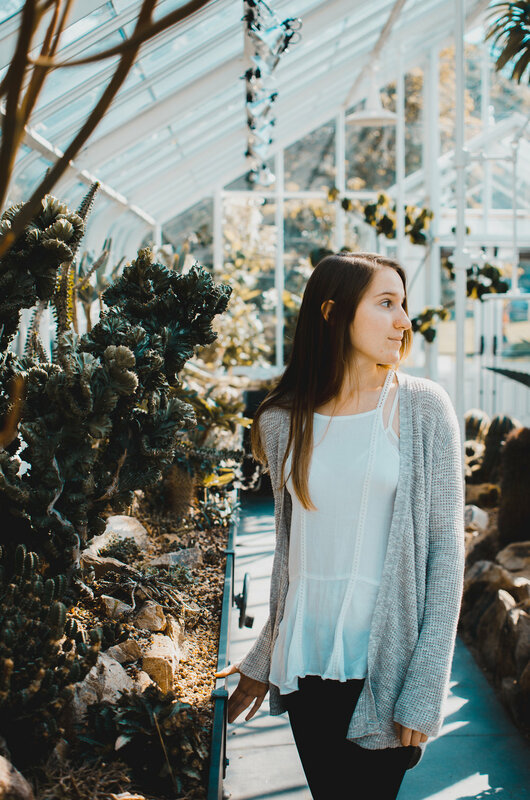 * First time Airbnb users: you can get $40 of free credit by using this link to create your Airbnb account. * First time Hipcamp users: you can get $20 of free credit by using this link to create your Hipcamp account. Stay at least two nights if your schedule allows for it. We stayed only one night after exploring Zion National Park, and wished we’d had more time to check out other areas near Hildale. Cook dinner at camp. 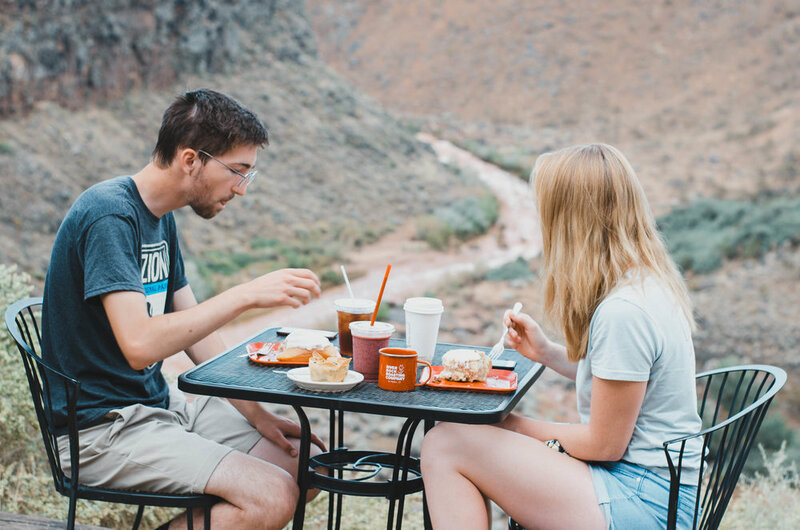 You can buy groceries in Hildale, use the cook stove or fire pit at the glamping site, and wash your dishes at Maxwell Park. Pack a bottle of wine and a couple of glasses. The glamping site has a deck and two chairs perfect for enjoying the evening from. Wolves and Waterfalls was welcomed as a sponsored guest to Robert's glamping site. As always, all opinions are own.